For gas fireplaces, the trend is shifting toward a more traditional look that replicates a log set rather than the glass beads that have been popular over the past few years. Room designed by Nyla Free. Photograph by Phil Crozier. There are few things that make a room seem more warm and welcoming than a fire burning in a fireplace. But too often an unused fireplace is an unwelcome addition to a room, adding maintenance woes and taking up space in a central area. Replacing or renovating a fireplace and surround can be not only time consuming, but costly depending on the situation, so getting it right is paramount. We talked to local designers and decorators about what you need to consider, whether you’re building a new home, adding a fireplace to your current home or revamping an existing hearth. 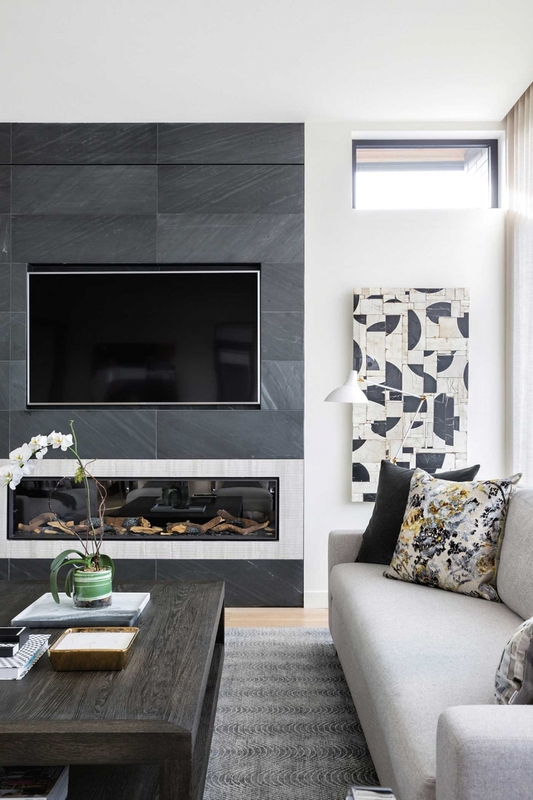 Designer LeAnne Bunnell tells clients to start by thinking about the intention of both the fireplace and the room you want it in. Is the fireplace meant to heat the room, create a focal point or add ambiance? “The aesthetic, the choice of gas versus wood, the size of the firebox and the finish selection, all hinge on the answer to these questions,” says Bunnell. Nyla Free, another Calgary-based interior designer, suggests thinking beyond the traditional placement of the fireplace in the living room. She notes that direct-vent fireplaces allow designers and homeowners to add a fireplace into a principal bedroom, dining room, outdoors or even into a bathroom. No matter what your style or preference for gas or wood, there is a fireplace for you. “The goal is for you to just love sitting beside your fireplace,” says Jason Meyer, president of Hearth + Home Fireplace. When thinking about whether to install (or convert) a wood- or gas-burning fireplace, again consider how you live, what you like about fires and how you want to use your fireplace. Wood offers the advantage of a homey crackle, and the advantage (or disadvantage) of the smell of both wood and smoke. Gas is cleaner in every way: there are no ashes or wood chips to clean up, no smell and the fuel itself burns cleaner than traditional wood (although high-efficiency wood-burning fireplaces are more comparable). Gas inserts can also be installed more easily in many areas of the home. Room designed by Louis Duncan-He of Louis Duncan-He Designs.Photograph by Louis Duncan-He Designs. According to decorator Louis Duncan-He, one of the biggest trends right now is playing with scale, especially floor-to-ceiling surrounds. 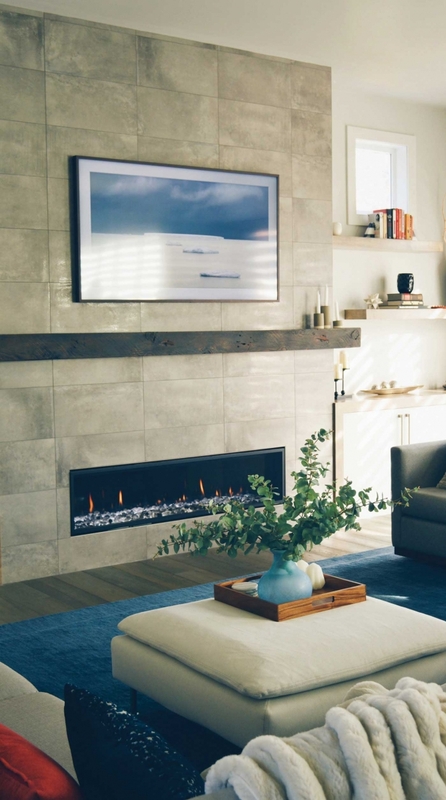 According to Jason Meyer, president of Hearth + Home Fireplace, for gas fireplaces the trend is toward taller fireboxes, while for wood-burning, the move is toward linear fireplaces. Room designed by LeAnne Bunnell. Photograph by Jared Sych. Large-format tiles and stone slabs create cleaner visuals with fewer seams, allowing the beauty of the material to stand out, says interior designer Nyla Free. Modern fireboxes allow for combustible materials to be placed much closer to them. This means decorators and designers can even use wallpaper around certain models. 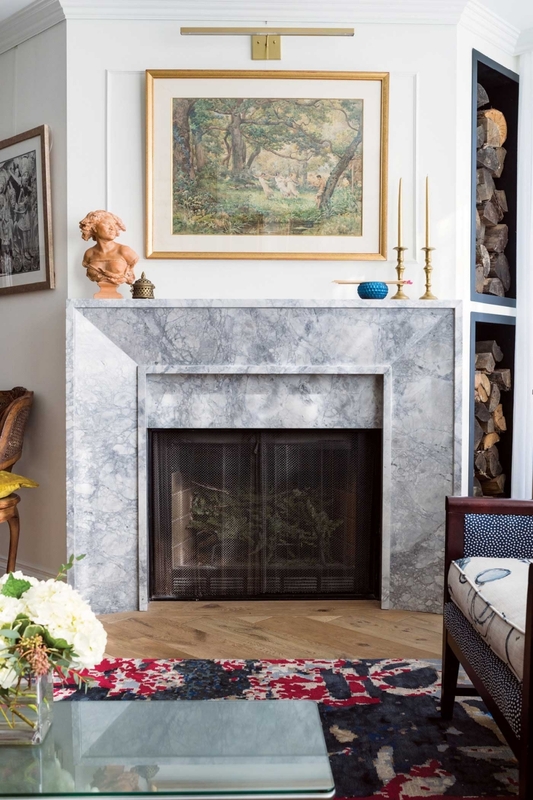 According to interior designer LeAnne Bunnell, that ability to bring combustible materials right up to the firebox allows for very crisp and refined results.